A quartet of cow elk seem quite unimpressed at the amorous bugling of a bull in Rocky Mountain National Park. My wife and I spent a recent long weekend in and around the park. While the fall colors were on the downside of their peak, the elk put on quite a show. After experiencing how skittish the elk are near our cabin on the western slope of Colorado, I was amazed at how tolerant they are toward people in the Park. 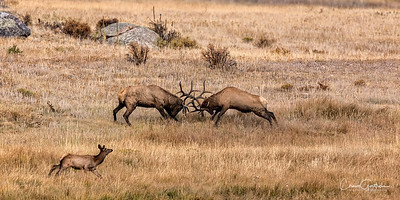 A pair of bull elk spar for dominance during the fall rut in Rocky Mountain National Park. This was our first experience actually being able to see some of the tussles between bulls - pretty wild! As the bull elk were filling the autumn air with their bugling, testosterone and general raucous behavior, these two cows decided it was time to put on a show of their own. 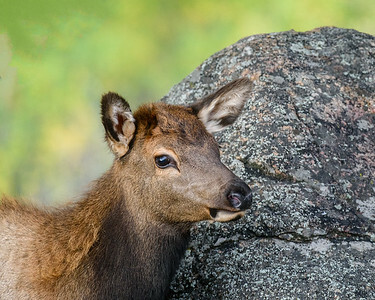 A bull elk poses in Rocky Mountain National Park. I had watched a bull with a sizable harem the night before working hard to keep his dominance intact. When I returned the next morning, what appeared to be the same bull and harem was still in the same area only closer to the road. Even at 400mm I could not get his whole body in the frame! A pair of spike bull elk spar behind a cow and a bull. "Mom and Dad" sure seem be trying hard to tune out the ruckus caused by the kids! This cow elk was so beautiful! And so close! This was with my D500 and at 400mm her face was all that would fit in the frame, which is exactly what I was after. I love the little piece of grass sticking out of her mouth, gives her that country girl look. While the bull elk are the ones that are all showy, rough and tumble, it is the cows that lead the herds and harems, and rightfully so! While we were in Rocky Mountain National Park, I tried to capture not only the bull elk as they jockeyed and sparred for the attention of the cows, but also to capture the beauty of the cows and rambunctiousness of the calves. This cow I think is particularly beautiful. I love the alertness in her eyes and ears, how her nose glistens in the late afternoon light and the wonderful shades of brown in her fur. She was so close I could not frame her with my fixed lens. Oh so beautiful! 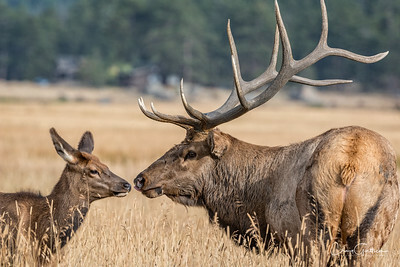 A bull elk shares a brief but tender moment with a cow amid the chaos that is the rut season. Not long after this photo was taken he resumed the tireless defense of his harem. A bull elk sniffs the air testing to see if any of the cows in his harem are in heat. I have WHAT in my ears? A pair of elk calves mirror their inquisitive looks at Moraine Park in Rocky Mountain National Park in Colorado while another pair hide in the tall grass. 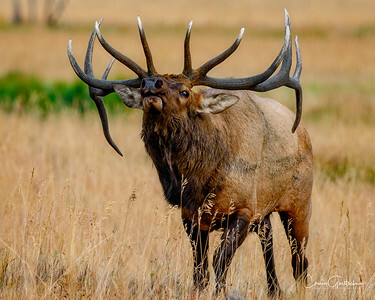 A majestic bull elk is ready to take on all challengers. Taken at Moraine Park in Rocky Mountain National Park, Colorado. A young calf scurries to get out of the way of two bulls fighting for dominance. An elk calf appears to be chastised for an alleged offense by this big bull. A cow elk shows off her radio tracking collar. My Dad's Better Than Your Dad!